1. Contest is open to persons who are 18 years or older. 2. There is one category, CUTEST FOAL. 3. Photos may be of 2017 foals ONLY. 4. All entries must be the work of the individual submitting the photo. 5. All “equine” foals are eligible, which includes horses, ponies, mules, miniature horses, donkeys, wild and feral horses, and zebras. 6. We are not allowed to post copyrighted photos without prior written permission. 7. Only one vote per person is allowed. 8. Three prize winners will be selected based on highest numbers of votes. 9. Equine Legal Solutions reserves the right to reject any photo entry due to unacceptable content or noncompliance with contest rules. 10. In case of a tie, Equine Legal Solutions staff will vote to break the tie. 11. Contest ends at 9pm PDT on July 31st. 12. Winners will be announced on Tuesday, August 1st. 1. Limit of one entry per person. 2. Enter your foal on our FB page using the contest submission form. Include the foal’s name, your name, mailing address (so we can send you a prize if you win), email address and telephone number. Your contact information will be kept confidential. 3. After you have submitted your entry, share your photo with your FB friends so they can vote for your foal. They MUST go to the Facebook page to vote – a “LIKE” on the shared post will not register as a vote for their foal. 4. 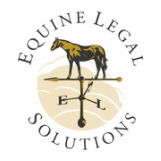 Make sure you “Like” our Equine Legal Solutions Facebook Page so you’ll be notified of contest results. 5. Winners will be announced on Tuesday, August 1st. 6. Click here to enter the ELS Cutest Foal Contest. 7. NOTE: Facebook requires Android smart phone users to upload photos in a web browser rather than the Facebook application. Use this link to submit your photo. 1. Share your photo on Facebook and tell all your friends to go to our Facebook page and VOTE for (not “LIKE) your foal! 2. The 3 photos with the most votes during the contest period will win prizes.